The sequel to one of the few books to ever make me laugh aloud in public. A good while back, I covered Willful Child, a raunchy, tongue firmly in cheek parody of Star Trek, that managed to squeak out some surprisingly deep philosophical ground between its story’s varied shenanigans. It did to Star Trek what Spaceballs did to Star Wars, and wasn’t afraid to skewer a few other properties along the way. Unbeknownst to me but knownst to others at the time of my review, the sequel, Wrath of Betty, was already widely available. This knowledge escaped me until recently. So, I set aside some time to catch up on the continuing adventures of Captain Hadrian Alan Sawback and the crew of the A.S.F. Willful Child. I laughed again, nodded my head along to every reference again, and generally had a good time while also being prompted to think about life, the universe, and everything. This is something that I feel confident in saying that most of us authors, especially those involved in science fiction, could ask for nothing more out of a reader reaction than that. …the Betty character really only serves as a bookend for the beginning and end of the story. There was a point where I even forgot that he was in the novel at all. 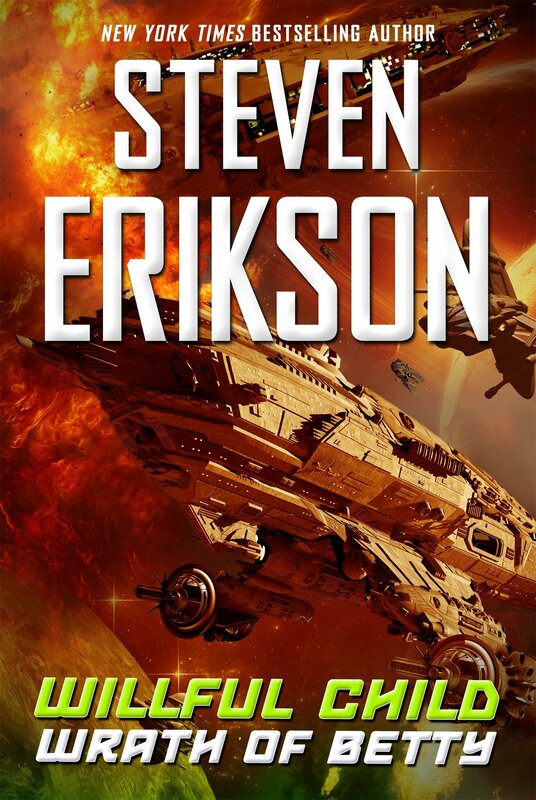 I’m not sure if this can really be blamed totally on Steven Erikson or if this can be attributed to some misguided marketing, as the back cover makes the Betty character out to be a bigger threat to Captain Sawback, when in fact his main antagonists are within his own organization and in some cases on his ship. The main selling point to me in this series is the humor, and it is on point again, though I really did have more fun with the comedy in book one. Somehow, Sawback, though still a total cavalier, didn’t strike me as quite as much a rapscallion this time, as if he’d been reigned in just ever so much. I had the most fun with returning crewmembers Sticks and Galk, whose dialogue I could read at great length and not tire of. Also a highlight is the perpetually anxious and drug-addled Chief Engineer, Buck DeFrank. Aside from the humor perhaps not being quite as sharp as before, I also noted how much more absurd and unlikely the names of new characters were, as though they all walked out of a factory that makes bad puns for James Bond characters. To me, it stretched credulity in a sci-fi world that in book one almost seemed (unfortunately) on the verge of being all too likely and believable, given humanity’s track record. However, I don’t take that away from the overall enjoyment I had with The Wrath of Betty, nor from the somewhat pontificating moral message hidden between the madness. It’s a quick but not too quick read, with a great deal of variety, fun characters, and a lot of irreverent shenanigans in space and alternate realities. This book, like its predecessor, made me laugh and made me think, and it didn’t forget to include a self-awareness about humanity, and the little slender ray of hope one can get from that awareness, so that we might be better tomorrow than we are today.